SEOUL, South Korea -- A senior North Korean envoy's meeting with U.S. Secretary of State Mike Pompeo has been delayed, throwing already deadlocked diplomacy over the North's nuclear weapons into further uncertainty. The State Department said in a short statement Wednesday the officials would meet later "when our respective schedules permit." It offered no reason, and the North's propaganda services has not mentioned the meeting. South Korea's presidential office said the government would later announce its stance over the postponed meeting, but South Korean news agency Yonhap said South Korean officials were notified by the U.S. of the postponement before it was announced in Washington. The U.S. State Department earlier said that the top U.S. envoy for North Korea, Stephen Biegun, was to join Pompeo and Kim to discuss how to get to what it calls "achieving the final, fully verified denuclearization" of North Korea. Last Friday, North Korea's Foreign Ministry criticized the U.S. for its continued support of sanctions and hinted it may resume nuclear development. The North Korean statement warned North Korea could bring back Kim Jong Un's trademark "pyongjin" policy of simultaneously advancing its nuclear force and its economic development if the United States doesn't change its stance. The North stopped short of threatening to abandon ongoing nuclear negotiations with Washington. Diplomatic sources told CBS News reporter Kylie Atwood as recently as Monday that senior State Department officials were still confident in the plans for Pompeo's now-delayed meeting in New York. 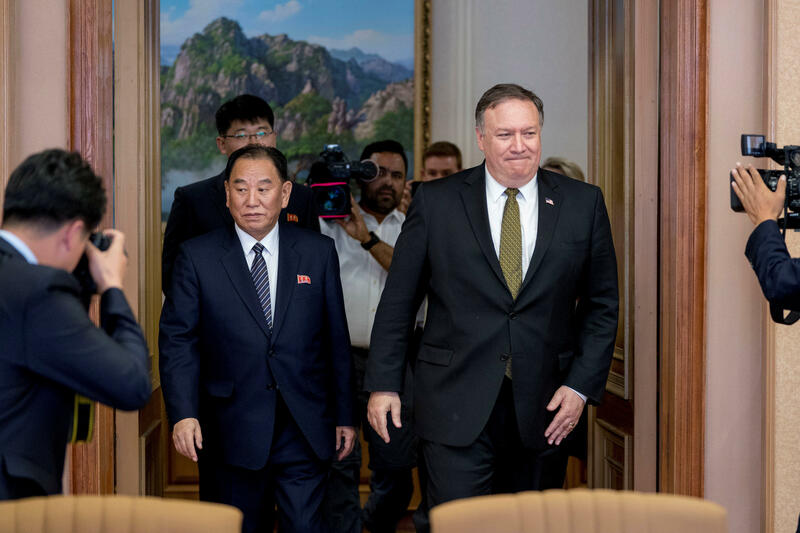 The State Department is keen to kick off working level talks with the North Korean side, which Pompeo said the North had agreed to during their last meeting. But that was in early October, and since then there have been no working level discussions. Atwood also noted that North Korea's state-run news agency KCNA has recently put out aggressive messages saying the Kim regime only suspended its nuclear testing with the expectation that the U.S. would begin easing sanctions. As CBS News correspondent Ben Tracy has noted from Beijing, the Trump administration thus far has stuck by its stance that sanctions against North Korea will only be dropped once denuclearization is achieved, or at least demonstrably underway. Ongoing U.S. joint military exercises with South Korea, although smaller than previous war games, and the fact that Pyongyang had been hoping for earlier sanctions relief, both prompted the North Korean delegation to decide to skip the planned meeting with Pompeo in New York this week, two diplomatic sources told CBS News' Pamela Falk at the United Nations. On Wednesday, Russia asked China to schedule a closed-door meeting of the U.N. Security Council for Thursday to discuss North Korea, Fedor Strzhizhovskiy, first secretary of Russia's mission to the world body, told CBS News. Russia and China have both advocated the easing of U.N. sanctions as part of a possible denuclearization accord, Falk reports.